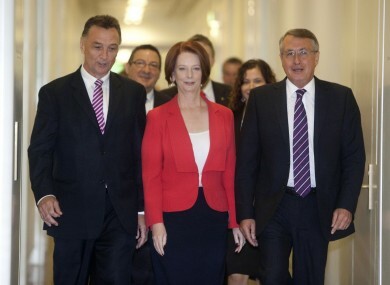 Australian Prime Minister Julia Gillard, centre, accompanied by supporters Craig Emerson (L) and Wayne Swan leave a caucus meeting after she won the vote for party leadership at Parliament House in Canberra. AUSTRALIAN PRIME MINISTER Julia Gillard has seen off a leadership challenge from her immediate predecessor Kevin Rudd. The ballot, held among members of the parliamentary Australian Labor party, saw Gillard overcome Rudd’s challenge by 71 votes to 31. Gillard had been widely expected to win the ballot, which was called after Rudd quit his post as foreign minister last week saying he did not enjoy the confidence of his prime minister. The margin of victory, however, was a boost to the under-fire premier – and may help her tighten her grip on power. Afterwards, Rudd – who had initially denied plans to try and contest the leadership, but who later put his name forward for the leadership anyway – said he was offering his full support to the winner. Gillard herself described the vote as an “overwhelming endorsement” and looked forward to the next federal election – to be held by November 2013 – where Gillard will hope to win a second term of office, and a third consecutive victory for Labor. “I can assure you that this political drama is over, and you are back at centre stage where you should rightly be,” Gillard said in a TV address, indicating that a cabinet reshuffle – where she will replace Rudd and any other defectors – will be announced this week. The Australian said that one MP who had led the faction against Gillard has also resigned his ministry, explaining that his departure would help to heal the party. Rudd is expected to return to the backbenches but remain an MP, before retiring at the next election. If he were to resign, Labor would risk losing the by-election – and therefore sacrifice its single-seat majority in the Australian House of Representatives. Opposition leader Tony Abbott, whose Liberal Party have been out of office since Rudd won victory in the 2007 election, said the result was “merely a stay of execution”. Email “Australian prime minister Julia Gillard sees off leadership challenge”. Feedback on “Australian prime minister Julia Gillard sees off leadership challenge”.